When you want to experience the raw, natural beauty of scenery beyond the reach of the average traveller it's time to turn to Earthcruiser for your total travel solutions. Earthcruiser matches the best of off road camping and travel comfort with the best of off road driving ability to create the most capable way to visit locations around the world that could otherwise be inaccessible. In the first half of 2018, Earthcruiser released its most advanced expedition model based on the Mercedes-Benz Unimog U430. With 300hp of German engineering to carry the Earthcruiser Explorer XPR440, the combination of these two leading manufacturers has produced a level of exploration superiority that can literally take a family to experience the tour of a lifetime and bring them back safely to civilisation. For the second half of 2018, Earthcruiser has one again lifted the bar to restricting adventure in comfort by adding the Mercedes-Benz G-Pro to its vehicle range. Proven in use by Defence Forces throughout the world, the Mercedes-Benz Unimog and G-Wagon both possess the same unquestionable reliability and off-road performance potential. 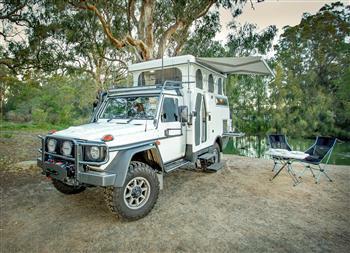 The Earthcruiser Mercedes-Benz G-Pro Escape is for adventurers that want to travel "off the radar" as they explore without the constraints of normal all-terrain vehicles. Soft sand or slushy mud can create an obstacle to travel where you choose. Should the unforeseen occur and traction becomes difficult, the standard fitment of 13.500 lbs power winches, both front and rear, can quickly assist in returning your G-Pro Escape to the role of providing safe and reliable transport. Powered by a V6 Mercedes-Benz Diesel V6 engine, maximum power is a reputable 135 kW with peak torque rated at 400 Nm and matched to a five-speed automatic transmission. The 3430 mm wheelbase with front, centre and rear differential locks is teamed with uprated shock absorbers, an onboard air compressor, individual 250 litre tanks for fuel and water and an upright 122 litre capacity fridge/freezer. The latest Lithium battery technology powers all requirements and recharges the electrical systems through solar panels when stationary, or via the 120 Amp vehicle alternator system when on the move. A rear mounted, independent air conditioning unit keeps the luxury accommodation cool, while the G-Pro cabin has its own integral air conditioning unit while on the move. Home comforts include an internal shower and toilet, plus a supplementary external shower unit for those moments of travel solitude. A double bed, plus a sky bed option that sleeps three, means an end to sleeping rough on the ground. Catering while on your travels is also made easy, thanks to a diesel-fuelled cooker. In addition to the standard inclusion of telematics with satellite tracking and monitoring, vision from five externally mounted cameras provide 45 days recording in real time, which may be viewed globally, with systems control managed via an IPAD touch screen. When you choose to communicate the options include an 80-channel UHF radio, with a DVR/GPS/4G solid state cellular hot spot (through its 6-dba gain antenna). Charting your progress is also made easy, with the onboard navigation system pre-loaded with Hema mapping, Bluetooth and iPhone connectivity. When the time comes to transport your go-anywhere Earthcruiser G-Pro long distances between destinations or across oceans, the compact external overall dimensions enable you to slot your adventure traveller into a standard ISO container for onward shipment. For Onroad Cruising, Offroad Camping, or No Road Adventure chose Earthcruiser Australia!